That would be my description of the historic little town sitting on the edge of the Alpilles Natural Park. 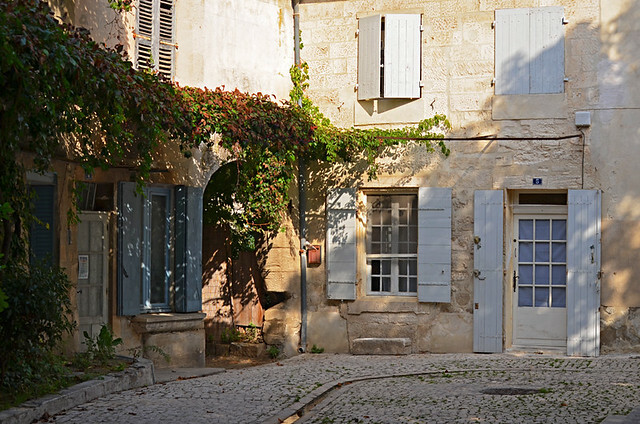 It’s probably fair to say that whilst Saint-Remy de Provence charmed us, some of its residents didn’t. The woman in the tourist office was one of those people who is polite and answers the question you ask; no more, no less. But she didn’t enthuse; she didn’t sell the town in the way that the girl in Fontvieille had done that morning. It wasn’t a deal breaker. 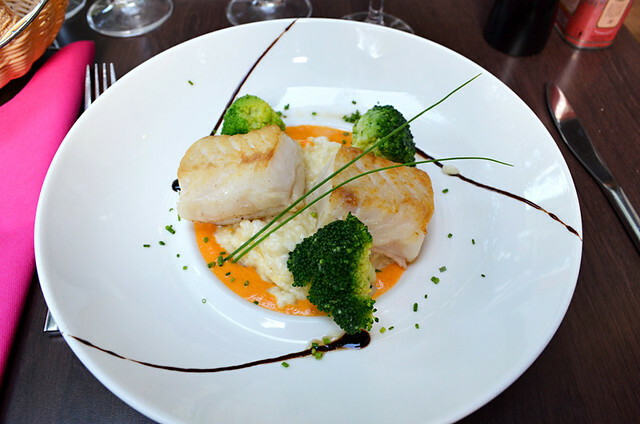 Unfortunately the staff at Brasserie des Variétés (32 boulevard Victor Hugo) were equally unenthusiastic. It was the wrong end of lunch time for the French and that may have explained the almost brusque replies to questions about the plats du jour or the fact that the ‘beautiful and I know it’ waitress kept ‘forgetting’ to bring the code for the wifi. The food, to be fair, was very good; artistically presented and nicely cooked. However, the general aloofness detracted from what should have been a relaxed and tasty lunch before an explore of the historic centre of Saint-Remy de Provence. Instead of relishing the Provence ambience and our food, we bitched about the air of smug superiority. Not a good introduction. 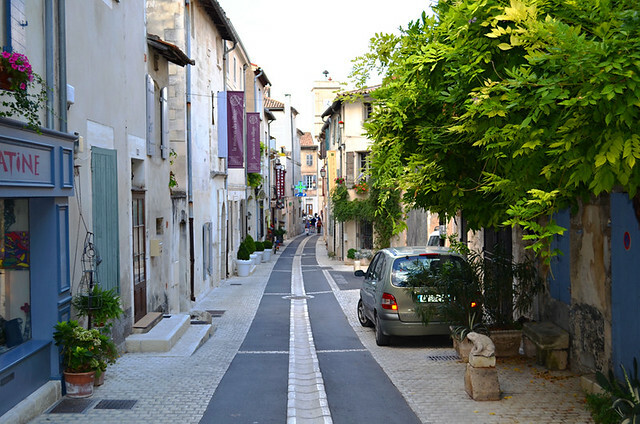 The old town of Saint-Remy de Provence is compact with narrow streets that interweave. It doesn’t take long for a tour of its quirky attractions. Porte St Paul is a portal linking the more modern part of town with one of those typically quaint French, narrow streets populated by town houses with pastel shutters, restaurants and cafés and arty shops with retro pedal cars. 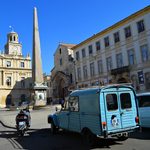 Within the network of streets are museums and galleries inside elegant buildings; the Musée Estrine, an 18th century now an art gallery and Van Gogh centre (closed when we visited) and the Musée des Alpilles, an ethnological museum in the Mondragon Mansion. As our time in Saint-Remy de Provence was limited, we’d been totally captivated by the Carrières de Lumières and stayed longer than intended, we kept out of the museums and stuck to what there was to see in the streets; like the Fontaine aux Dauphins in Place Pelissier. A curio rather than anything spectacular, the Dolphin Fountain was built in the 19th century in honour of Louis XVIII. 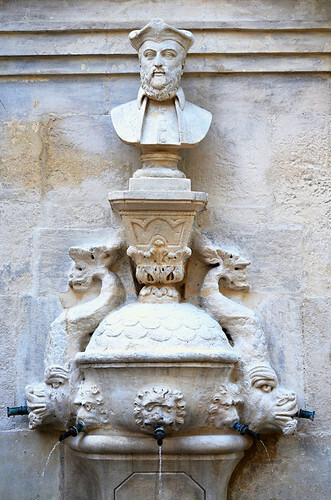 More interesting was the Fontaine Nostradamus located where Rue Carnot meets Rue Nostradamus. Interesting because it features an historic figure whose prophecies seemed almost like gospel to me when I was a wide-eyed child. 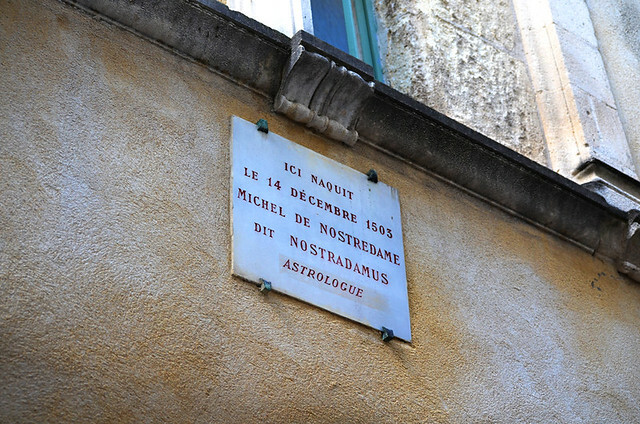 The spot where Nostradamus was actually born on Rue Hoche in 1503 is a non-entity of a house but it didn’t matter. It’s always a thrill to walk in the footsteps of giants of history. It will always be etched on my memory thanks to a group of Americans who, as they surveyed the plaque identifying the spot as the birthplace of Nostradamus, gave us what was almost the top quote heard during our travels in France. This was said in total seriousness. I have no idea who they thought he was. In 1889/1890, Van Gogh spent a year ‘resting’ in Monastère Saint Paul de Mausole just outside the centre of Saint-Remy, near the Glanum Roman archaeological site and Les Antiques, another Roman site with an ancient Arc de Triomphe. 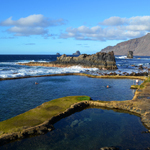 The tourist blurb calls the monastery a ‘rest home’. In Van Gogh’s day this translated as a psychiatric asylum. 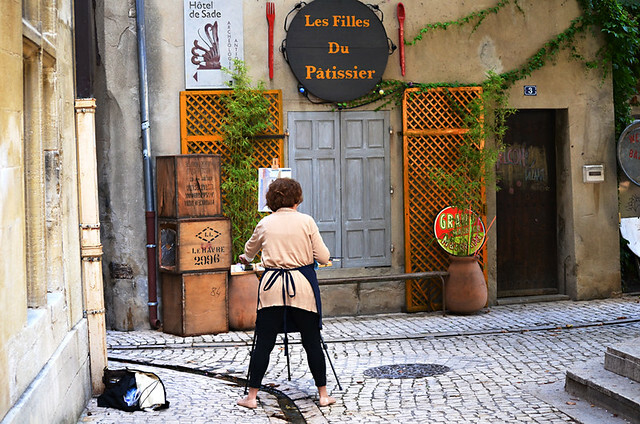 His artistic spirit courses throughout Saint-Remy, especially around Place Favier; a ridiculously pretty cobbled square bordered by stone buildings covered in meandering vines. Modern day Van Goghs peer from behind their easels, seeking inspiration amongst the emerald leaves and powder blue window frames. Watching their enthusiastic brush strokes made me thaw towards Saint-Remy. It was indisputably extremely easy on the eyes. We left the old town and popped across Boulevard Victor Hugo to take a look at the intriguing La Monde de la Truffe. As I took a few photos, a woman’s head appeared around a door. At that point we decided it was time to depart snooty and aloof Saint-Remy de Provence.